HomeArticlesYasser Murtaja: Did You Take Us A Last Photo from Above? Oh Yasser, we are bereaved now. We weep after you with words, as if our tears have found their way through our pens… We align our letters to mourn you. It’s all we can do. How can we eulogize you? Everybody knows you and knows your dream to travel and get the perfect view of Gaza on your camera from above the clouds. We all believe your soul has gotten that view now and your dream has been achieved through your martyrdom. 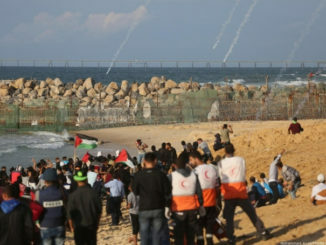 Yasser Murtaja, a Palestinian cameraman for Ain Media, was covering the events near the Eastern border of the Gaza Strip. In his dark blue shield, Yasser was making sure to convey a sincere picture to the world of what was happening. Although his eyes teared every time he inhaled the tear gas, he continued to smile, and his camera remained clear to deliver the truth. The thirty-year-old man left his family this time without taking a last photo of his only son, Abdul Rahman, or his family. He left home with nothing but a shield that could do him no good. His friends were crowding over his coffin trying to get a final glimpse of his resting, brown face. His funeral suddenly stopped along the way – perhaps his friends were attempting to stop time for a bit, get a final look, or a last feel of his pure body wrapped in the flag of his beloved homeland. His hands were covered and no one could shake hands with him, but his forehead sure received countless farewell kisses. His partner, Rushdi al-Sarraj’s voice was faint, tired in the morning before his friend’s soul departed his body. He thought that the bullet that reached the uncovered right side of Yasser’s abdomen could not kill him. He would survive, he believed, take more blood units, rest a little, and then go back with him on the next mission. “We were 300 meters from the snipers. Yasser’s camera was set to record automatically and I suddenly saw him fall down bleeding. He fell but his camera did not cease to film”, said his twenty-five-year-old colleague, Rushdi, before he ran after his injured friend. The martyr had needed blood transfusion. Everyone started to call for blood donations on social media, asking people to give him a little of the plenty A+ blood available in this world. The amicable journalist needed about 14 blood units to compensate for the lost blood from his severe injury. The attending doctor at Nasser Hospital in Khan Younis, Dr. Mazen Safi, said that the bullet caused injuries in Yasser’s liver, spleen, kidney, arteries, and muscles. “Yasser fought to live,” said doctor Safi. Perhaps death can grant him his dream to travel and manage to take the young man’s soul on an eternal journey without the need for any material luggage. 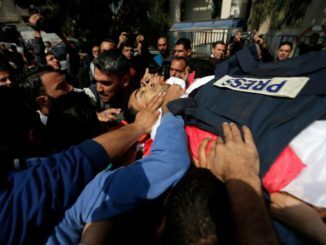 Yasser’s uncle, Dr. Abdul Hameed Murtaja, said that the injury was a direct and deliberate assassination of a journalist carrying his camera and wearing his journalist vest. There are many painful funeral scenes that you have not witnessed, Yasser. This time, you are the story. Perhaps you found another way to achieve your dream of leaving. Perhaps Rafah crossing will open for someone else one day. 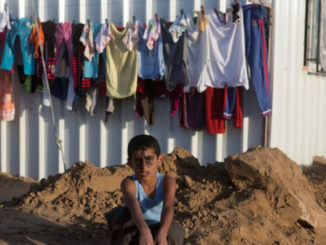 Perhaps another dreamer will travel, and we will live to tell the stories, facing death as we usually do in Gaza and holding hard to the memories that we have of those gone. We live our lives running away from bullets and hiding from the gas bombs, while continuously praying to Allah to show us the way. We believe that all dreams are achieved in heaven. 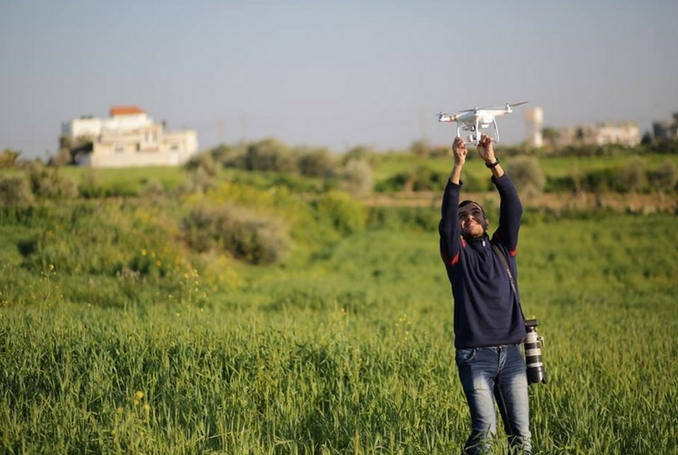 All dreamers can fly and take beautiful photos of Gaza, where it seems very small with the overlapping colors of its blue sea, green fields and grey streets. You will see the contradiction yet understand it. You could easily explain how it dies to live. Don’t worry, Yasser! Allah is the most Gracious, so don’t worry!